The Education Ministry on Monday defended a pro-CPP speech delivered to some 1,500 students at a university in Phnom Penh on Sunday, reasoning that the school did not breach the ministry’s new directive against political activity at academic institutions because classes had finished for the semester. The ministry’s directive, issued last month, threatens to shutter institutions, expel students and sack teachers found to have engaged in political activism or allowed the proliferation of politically aligned associations on school grounds. “We do not need the educational establishment to be a political arena for fighting—we want teachers and students to focus on studying,” Education Minister Hang Chuon Naron said last month, explaining the directive. 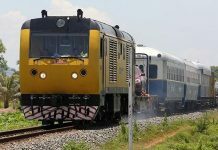 Critics blasted the order, pointing out that two of the associations most active in schools—the Cambodian Red Cross and the Union of Youth Federations of Cambodia (UYFC)—are run by the wife and son of Prime Minister Hun Sen, respectively. 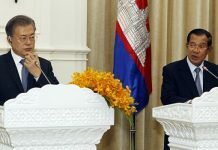 In a speech at the Institute of Technology of Cambodia (ITC) on Sunday, Foreign Affairs Minister Hor Namhong—standing next to Mr. Hun Sen’s son, Hun Many, a CPP lawmaker and head of the UYFC—praised the ruling party. “I suggest that all of you throw your support behind His Excellency Hun Many—our brilliant, young, intellectual leader of the UYFC—to lead our youth to join as the core force with the government to develop the country,” Mr. Namhong said during the event, organized in part by the UYFC. 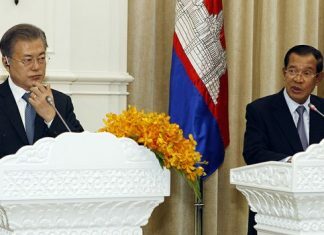 “Cambodia is so very fortunate for having Samdech Techo [Mr. Hun Sen] as a statesman with political talent, which is hard to find in Cambodian society,” he added. The foreign minister went on to describe how the CPP worked to enhance its young member’s political prospects, noting that a large number of youths were part of the party’s central committee. ITC director Oum Romny could not be reached. His deputy, Nuth Sathan, declined to comment on the event. Education Ministry spokesman Ros Salin said the speech did not violate the ministry’s directive against political activity. Mr. Salin said other organizations could be allowed to hold similar events if they received approval from the ministry. “We would need to see a proposal and then decide,” he said.